Freshman Miguel Cartagena will need to help fill the role of on-court general in Joe McDonald's absence. After trailing by as many as 13 points in the first half, the men’s basketball team showcased a crucial aspect of their team identity Saturday: resilience. Outscoring the Manhattan Jaspers 50-35 in the second half, the Colonials earned their first road victory of the season, improving to 3-0 for the season – their best start in seven years. With the 80-74 win, GW is in a good position to keep winning. With a very manageable game Tuesday against a 1-2 Delaware State team, the Colonials have the opportunity to go into the much-anticipated, California-based Wooden Legacy tournament 4-0. With the solid win over a Manhattan team that was picked to win the Mid-Atlantic Athletic Conference this season, suddenly, the Colonials’ role in that tournament could be more than just a schedule-filler. GW is averaging 88 points through its first three games of the season, while holding their opponents to 69.7 points per game. On top of shooting 50 percent from the field, the Colonials have proven to be a formidable three-point shooting team, converting 22 of 52 three-point attempts. The Colonials had just 84 three-point field goals all of last season. GW (3-0) struggled to keep up in the first half with a Manhattan (2-1) team who seemingly had control over every aspect of the game, dictating the pace and keeping the Colonials off balance. But GW also failed to help themselves. Head coach Mike Lonergan admitted that the team got off to a slow start, shooting just 42.9 percent from the free throw line in the first half – crucial points that would have aided a GW team that shot just 40 percent from the field in the half. GW took all but four-and-a-half minutes to mount a comeback against the Jaspers and take the lead in the second half – something not even Lonergan expected. The Colonials were led once again by graduate guard Maurice Creek, who had seven points in the first three minutes of the second half alone. Creek would continue to light up the stat sheet, finishing the game with 27 points and five three-point field goals. Creek’s 19.3 points per game through the first three games of the season leads the Colonials. Saturday’s defensive strategy was simple: stop Manhattan senior George Beamon. Before Saturday night’s matchup, Beamon, who was selected to the preseason All-MAAC First Team, had been averaging 26 points per game for the Jaspers, the Colonials’ biggest defensive challenge so far. Lonergan tried to contain Beamon by throwing different looks at the 6-foot-4 guard/forward throughout the game, starting with a man-to-man defense. But Lonergan said that Beamon’s ability to find a rhythm early on caused him to change his strategy, and forced him to play in a 1-3-1 set for the rest of the game in an attempt to contain Beamon’s productivity. Beamon would finish the game with an impressive 34 points and nine rebounds. But he would be the only real offensive threat for the Jaspers all night, as no other Manhattan player broke double figures in scoring – something Lonergan viewed as a defensive success for the Colonials, along with drawing the Manhattan frontcourt into early foul trouble. Senior Isaiah Armwood and sophomore Kevin Larsen were able to capitalize on the early foul trouble of the Manhattan team, helping GW outscore the Jaspers 34-18 in the paint. 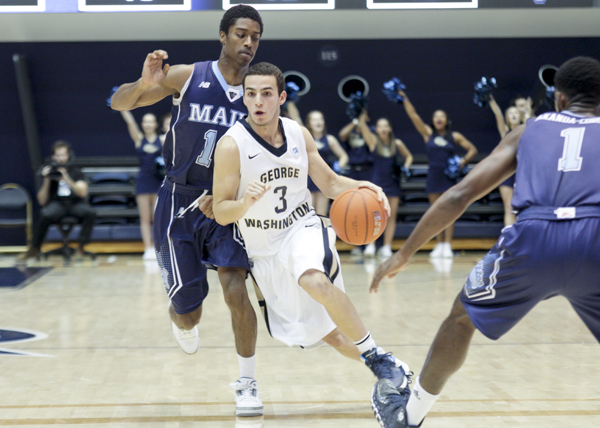 GW would also out-rebound Manhattan 43-30. Armwood finished the game with 20 points and eight rebounds, while Larsen finished with a double-double at 12 points and 10 boards. Saturday’s win was not the only comeback on the floor, as sophomore Patricio Garino returned early to the court after missing the first two games of the season with a fractured finger. Outfitted with a finger bandage, Garino, who Lonergan described as appearing “rusty” on the floor, played 23 minutes going 2-3 from the field. The sophomore guard/forward would finish the night with six points, three blocks and two rebounds. Lonergan said that along with free throws, team defense will certainly be a top priority for his ball club. But with nine days to prepare for their game versus Miami on Thanksgiving, the full-strength Colonials have a chance to make a real non-conference statement in front of a national audience.